Each year, final year students across the UK complete a National Student Survey to gauge satisfaction levels in key elements of their degree programme. 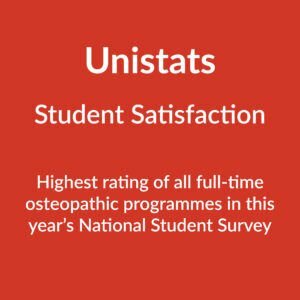 The results are in for 2017/18 and we’re delighted to see our Yr 4 students have given the ESO an 88% overall satisfaction rating for the M.Ost – outperforming every other full-time osteopathic programme! This is a great result and is testament to our collaborative approach to learning and the hard work and dedication of our management, staff and faculty. If you’d like to see how the ESO compares in all elements of the survey visit the Unistats website.